Natural enemies and pollinators can be harmed by pesticides and their populations are often more affected by pesticides than the targeted pests. For instance, many plant pests are stationary, while natural enemies and pollinators move about, and could encounter pesticide residues in more places. It is important to first identify your pest and learn which nonchemical methods may work to exclude, repel, or reduce the pest. The UC IPM web site contains a great deal of information for home, garden, landscape, and turf pests. If a pesticide is needed, consult the UC IPM website to determine which pesticides will specifically control that pest. 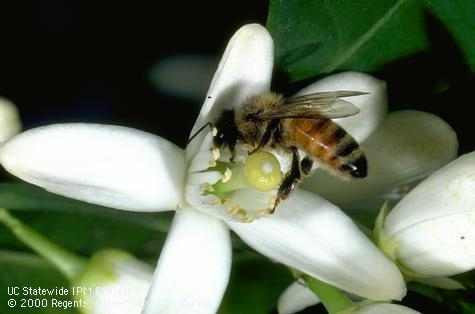 Neonicotinoids and other systemic insecticides translocate (move) within plants and can poison bees and natural enemies that feed on nectar, pollen, and liquids that plants ooze. Use sparingly or only when necessary. 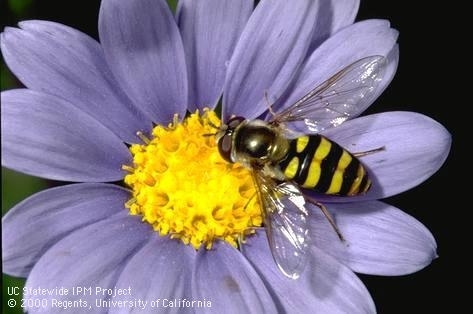 See the UC IPM web site for more information about pesticides, controlling pests, and protecting pollinators and other organisms.